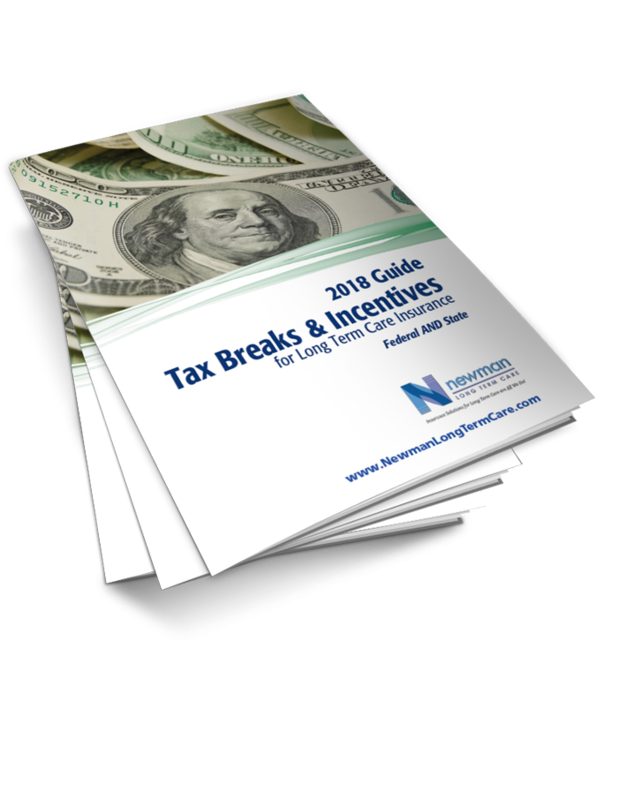 Get the "2018 Guide to Tax Breaks & Incentives for Long Term Care Insurance"
For individuals, business owners and human resource professionals who want an understanding of federal and state tax incentives for long term care insurance (LTCI). We represent insurance plans from leading carriers such as Genworth Financial, LifeSecure, Lincoln MoneyGuard, Mutual of Omaha, National Guardian Life (NGL), Nationwide, OneAmerica/StateLife, Securian, Thrivent Financial, and Transamerica. This is an insurance solicitation. An insurance agent from Newman Long Term Care may contact you. The long-term care insurance contract has exclusions, limitations, reductions in benefits and terms under which the contract may be continued in-force or discontinued. For costs and complete details of coverage, contact a Newman Long Term Care licensed insurance agent. Newman Long Term Care is not an insurance carrier. Long-term care insurance is underwritten by the insurance companies represented by Newman Long Term Care. Newman Long Term Care representatives and employees cannot provide legal, accounting, or tax advice or services. Work with your Newman Long Term Care representative, and as appropriate, your attorney and/or tax professional for additional information. Newman Long Term Care has focused exclusively on long term care planning solutions since 1990. We have helped 25,000 families plan for the consequences of a an extended care event. We work with individuals, businesses and associations to create the best solution for the end-users' needs. Our consumer centered approach means we focus first on our policyholders, not on profits. Because of our relationships, we believe we can offer more long term care insurance solutions than any other agency in the country.